I’ve gotten friendly with many fan filmmakers, and one of the things I find most fascinating is the wide variety of unique jobs they have. In some cases, like Vance Major of the Minard saga, they chat with me very late in the evening because they work the overnight shift. And that has been the case with David Whitney, as well. But I had been under the impression, from an earlier interview with David, that he owned a talent/modeling agency. That doesn’t seem like the kind of job where you typically work nights. JONATHAN – Just curious, David, what is it you do for a living? DAVID – I am a Tech Analyst—Network and Infrastructure Support in Des Moines. JONATHAN – So you answer phones all night, huh? DAVID – Yes, but mostly a radio. JONATHAN – You answer a radio? DAVID – I work at a tire plant: Big Ag Tires. They use a radio for production, and I get to monitor it. They’ll cal me for anything. DAVID – Oh, I do! In fact, I signed an amazing model this past weekend. Really amazing. JONATHAN – Tire tech at night, modeling maven at night…and you sleep when exactly? DAVID – Hah! I sleep occasionally in the morning until my phone starts ringing. I work from home, and I run the agency after 3pm until I go to work at 9pm. Then all my weekends are pretty busy at the studio in Boone, Iowa. JONATHAN – I promise I’ll get around to asking you about Quick Trek, but you’ve just got me so fascinated by your employment situation! So which came first, the night job or the day job? DAVID – I’ve worked at the tire plant for almost 15 years. I’ve been working on the agency for the last 4. It’s been slow going, but it’s picking up a lot lately. JONATHAN – That’s good to hear. So how does a guy who works in a tire plant decide to start, of all things, a modeling and talent agency in the middle of Iowa? DAVID – When I started making fan films, several actors and models began to complain about the local agencies and how they treat the talent. After a lot of testimonies, I began to look into it. Lots of agencies are nothing more than scams. They lie to kids and their parents and milk them for money. They may have clients, but they also use that power to pressure people into these classes and conferences that cost $5000 a person. These conferences heavily imply they will get noticed and work. They seldom do. They walk these kids around on a stage and never get 95% of them any work. I hear it over and over again. And the expensive conferences are completely unnecessary, as the talented will get work regardless of whether they ever go to these things. The fact is, an agent knows immediately what a talent’s categories are. There are no classes or meetings that can change the industry standards. For example, runway models have to be 5’9″ minimum to get work. These agents forget to tell them that. Anyway, that is why I do what I do. I want to fix this business here in the midwest. JONATHAN – Well, okay then! Keep up the good work, David. Now let’s segue into Quick Trek. Where did the idea come from, and when and how did it go from idea to finished fan films? Anyway, Tawnya came up with the idea for the first Quick Trek (the one with Janeway). 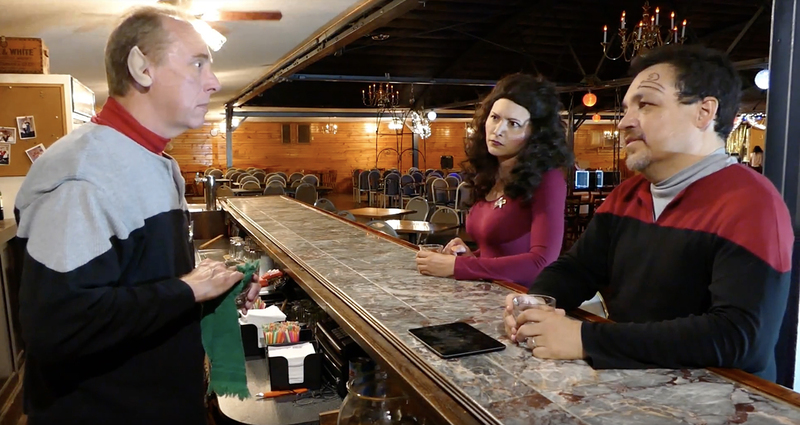 Tanwnya made all the connections for that, and we shot the whole thing in Ames, Iowa at the coffee place with her as Janeway. Then she helped me with Orangedale in the 25th Century and took the lead. After that, I realized what a moron I was for not knowing she was so talented and clever! JONATHAN – What’s Orangedale in the 25th Century? JONATHAN – It’s hard to imagine models coming out of Iowa, but I’ll admit those are some pretty darn attractive lasses (said the dirty-minded 51-year-old married guy). DAVID – I thought the same thing as you until I moved here. But they are all over. DAVID – By the way, I have kids and guys, too…and voice-overs. Just shot a short called “123 Puppet Place” for the kids. JONATHAN – Why isn’t the agenting gig your full-time job? DAVID – I don’t have enough customers. Plus I had to grow my bucket of talent. I am ready now, though. JONATHAN – Oh, well, that’s exciting! Good luck. But let’s get back to Quick Trek. So you released your first episode last year, and then you released your next four episodes nearly all at once a few months ago. Why so close together? DAVID – That I did, laddie! DAVID – I wanted to play a fat Chakotay for some time, and I grabbed JIM VON DOLTEREN to show up, and we threw some ears on him. Jim has been in many fan films now…. JONATHAN – That he has, laddie! 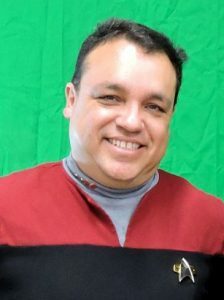 JONATHAN – Let’s see, he played the captain of the USS Constitution in “His Name is Mudd.” He played a Centurion the The Federation Files‘ “Extraction.” He was Captain James Corvus in your Voyager Continues: Raven fan film. He was the Captain of the Starship Republic in their vignette “Serpent of Yesterday.” And he’s going to be appearing in the upcoming 5-way crossover fan film Convergence. I think that’s all of them. Dude sure gets around! Okay, once again…back to Quick Trek! We keep getting thrown off course! DAVID – That’s how I like to roll. JONATHAN – So, did you film as Mudd and then change to Chakotay for the other two episodes and then film them? DAVID – Actually, no. The order we filmed was Quick Treks 5, 3, 2, 4. Numbers 3 and 4 were the Chakotay ones, and number 2 was Mudd, which was sandwiched between the two Chakotay ones. JONATHAN – How long did it take you to change wardrobe and do the forehead tattoo? DAVID – About 5 minutes. JONATHAN – Oh, that doesn’t sound so bad. Now, did Tawnya set up the filming lounge location like she did with the coffee shop in the first episode? DAVID – Yes. She knew the people who own it, I think. And the waiter really was a waiter. And the people in the background were real customers…and employees. JONATHAN – A fan film with extras…I love it! DAVID – Well, it wasn’t all smooth sailing. A real band was getting ready in the last shot of “Mudd’s Men.” You can see and hear them. JONATHAN – Was the band at least Star Trek-inspired? DAVID – Country I think…. JONATHAN – Oh, well. So you filmed all four episodes at the same time…? DAVID – Yep. All with the Cheers theme…one with a script that Tawnya and I wrote together. JONATHAN – So you finished that and just started ad-libbing more? JONATHAN – Which one had the script? JONATHAN – And the rest were all done on the fly? DAVID – Tawnya had written a few of her lines down for Troy watching TV in “Joy and Gratitude.” She had the idea for that one. The show on the television was going to be a Jerry Springer episode, but I didn’t’ want to deal with copyright issues. So I found the Superman piece..
JONATHAN – So why did you decide to ditch scripts? DAVID – I like winging skits. We had two hours to do it all. We finished the first episode with enough time to do three more. You see, Tawnya has moved to Arizona, so we were rushed for time. JONATHAN – So no more Troi? DAVID – Actually, we haven’t lost her. I have a camera guy in Scottsdale. She’ll be Janeway again. And when she comes back to visit, we’ll do more. But I’m kind of in charge of Quick Trek now. JONATHAN – You weren’t before? JONATHAN – So you had yourself, Tawnya, and Jim in front of the camera for your four shoots. Who was behind the camera? DAVID – We had no camera or sound people for the four Quick Treks in the bar. JONATHAN – So what was the filming like if you had no camera person? DAVID – We just lined up the position of the shot and rolled. Whoever wasn’t in the shot was cameraman. We used my tablet for the mic. JONATHAN – Clever! But there are some scenes where there’s three of you in the frame at the same time. JONATHAN – Of course…how silly of me! 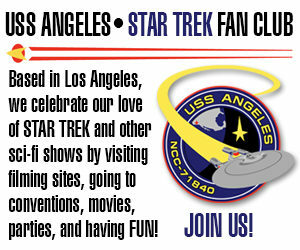 So what else is on the horizon for Starfleet Studios in the near future? DAVID – We’re currently working on Raven, part 2. We are scheduled for filming October 21 at Midwest Model Studio…all green screen. Also, I’m working on redoing all of the exterior ship CGI for the first Raven fan film. JONATHAN – Are you doing that before the CGI for part 2? DAVID – No, all the CGI for Raven, part 2 is complete. It came out so well, that I decided to update part 1, as well. JONATHAN – When can we expect to see Raven, part 2 and the re-done part 1? Which will debut first? DAVID – I’m aiming for this month for the Raven 1 redo. No idea about Raven 2 yet. JONATHAN – Well, I can’t wait to check them out. Thanks for another great interview, David, and keep on Trekkin’.